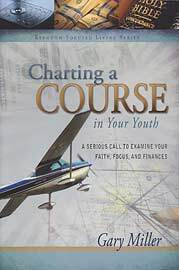 Charting a Course is a call to youth who are serious about following Jesus, especially in finances. It is designed to help them develop a Christ-centered focus early in life and find their way through society's confusing swirl of gray. Using illustrations from his experience in flying airplanes, Gary points youth to timeless foundational Biblical truth. The many stories capture the reader's attention, and young people will find it engaging reading.